Putting up a curtain railing is a lot easier than it looks and takes you only 5 minutes, depending on the length of the curtain rail that you want to put up. 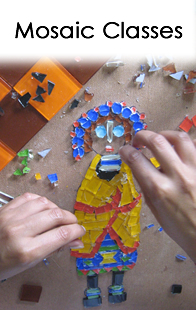 For this exercise I have used a short 1 meter curtain rail. 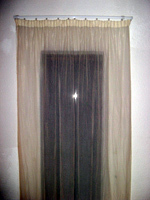 What you will first need to do is measure the drop of your curtain using the measuring tape. Lets say that the curtain is a 2.2 meter drop. 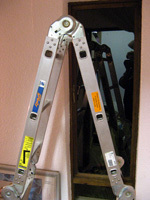 Use the ladder and place it in front of the window where you want to hang the curtain. 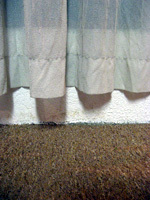 Take the measuring tape and measure from the ground up the length of the curtain. Now depending on how you like your curtains hanging, you now need to look at how high above the ground you want the curtain to hang. I prefer it to hang about 5cm off the ground as it won’t get damaged when you clean or vacuum the floor. So, along with the measurement you have just made, add on another 5cm, this will lift the curtain off the ground. 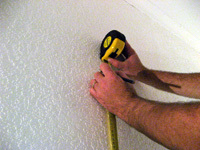 Using the pencil, make a mark on the wall where your measurement ends. Now take the curtain railing and position it where you have made the markings on the wall, placing the bottom part of the railing on the mark. 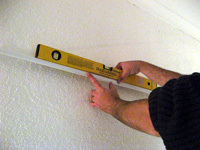 Use the spirit level to position the railing so that it is straight. 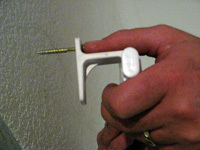 After positioning the curtain rail, use the pencil to make the marking on the wall through the drill holes of the curtain railing. Remove everything now. Take the power drill and put the 6mm masonry drill bit in. 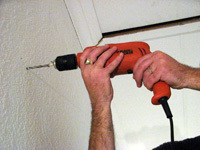 Before drilling the holes into the wall, make sure that the drill has got the hammer selection on. Drill the holes into the wall. 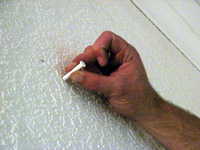 After doing this, take the two 6mm wall plugs and screws. 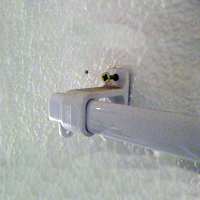 Put the plugs into the holes you drilled into the wall take the screws and put them through the holes in the railing and then insert them into the wall plugs. These will now hold the curtain railing in position for you to hammer screws into the wall. 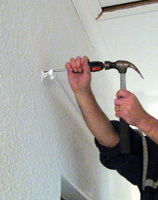 Using the hammer and the Phillips (star) screwdriver, place the screwdriver onto the screw and use the hammer to hit the back of the screwdriver which will drive the screws into the wall.  You have now put the curtain railing onto the wall and can now hang your curtain.